Welcome to the website of Jorge Santo. 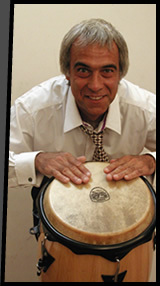 I’m a London, UK based percussionist specialising in Afro-Cuban Percussion, which involves instruments such as conga drums (tumbadoras), bongos, timbales, claves, cowbells, guiro, maracas, etc. I am a musician playing with salsa and Latin bands around the UK, have many private students and regularly give workshops in schools and in community settings. I was born in Buenos Aires, Argentina. I spent five years studying in Havana, Cuba with some of the most celebrated names in Cuban percussion, and have performed in numerous venues in Canada, Cuba and England, and now live in the UK. To learn more about what I do click on the links above.